Forgive us for maligning a favorite film hero, but James Bond had it all wrong. Martinis are best when stirred, not shaken. And to stir in absolute style, we suggest reaching for a Japanese mixing glass. Beyond bringing looks to the table with eye-catching design, Japanese barware has plenty of function to back up form. 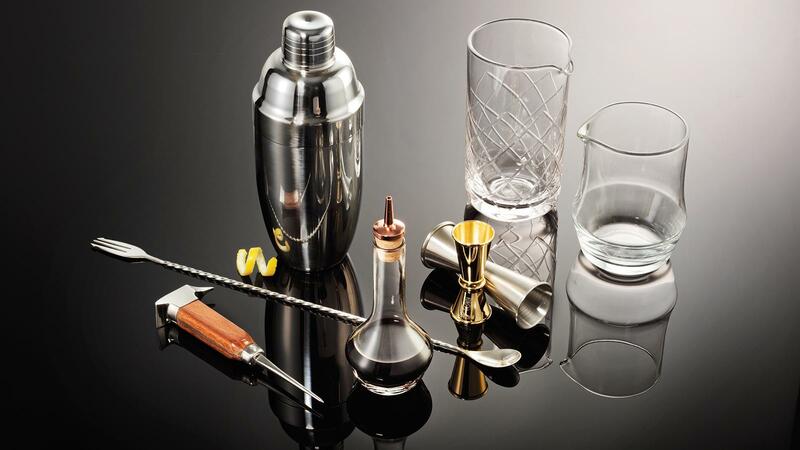 These tools make drinks that your guests will long remember, and they have a storied history. "The Japanese influence on American bartending is pretty profound," says Greg Boehm, owner and founder of Cocktail Kingdom LLC, a Manhattan-based company that sells a wide range of high-end barware, much of it inspired by Japanese designs. During the late 1800s, what Boehm calls "the golden age" of cocktail culture in America, Japanese craftsmen began to emulate the superb Western bar tools. Much of American cocktail culture was lost to Prohibition, but in Japan, drinking continued without the interference of Eliot Ness and the Untouchables. And the bar culture persevered. What began as American craft tools were preserved—and some cases, improved upon—in Japan. Today, those in the know look to Japanese-style tools, such as those made by Cocktail Kingdom and Umami Mart, to improve their own drinks. (All pictured items can be had for between $15 and $52.) For Martinis, Manhattans and Vieux Carres, start with a Japanese-style mixing glass. Cocktail Kingdom's Yarai mixing glass stands six inches tall, suitable for mixing for a crowd. The etching on its lower half is not only for aesthetics, but provides a grip when pouring from the beak. The thick, glass base on Umami's short mixing glass adds stability. Use a jigger to measure ingredients, add a few chunks of ice (perhaps using Umami's Ice Anvil), take the Trident bar spoon from Cocktail Kingdom and begin stirring. Making a cocktail this way is admittedly slower than shaking, but good things can't be rushed. "Shaking a drink is a much quicker way of getting it cold," explains Boehm, but it also clouds it with bubbles and ice chips. Stirred drinks are clearer, with a more viscous mouth feel. Drinks that contain juice (Sidecar), egg (Whisky Sour) or cream (Brandy Alexander) do call for a shaker. The strict specifications of Cocktail Kingdom's cobbler shakers solve a problem that is endemic to the three-piece-marvels: they can be hard to pry apart when cold. The company's beveled bottle is for keeping your bitters. Boehm knows his way around a good drink. He poured his first cocktails at an all-too-early age. His grandfather, a regular imbiber who couldn't see terribly well, taught him how to make a Manhattan at age five, so he could bring it back to Grandpa. Those were the days.